Our little holiday town is a pretty place, welcoming and fun. The countryside that wraps around us on three sides is deliciously pretty, just as interesting as it is beautiful. We have some awesome attractions to enjoy in the town itself and the surrounding area, something for visitors of every age. Our shops are great, we’re stuffed with galleries, and our pubs are legendary. But at the end of the day holidays in Newquay are all about the water, the glittering ocean, the gorgeous blue waves. It’s all about the sea. Right now the water temperature is a bit higher than the average for this time of year, around eighteen degrees thanks to the heatwave, so it’s heavenly to be in, on and around. If, like many of our visitors, you’d like to get on board a boat and explore the briny for yourself while you’re here, there’s plenty of choice. Here’s a run-down of boating tours in Newquay plus a few more water-led adventures for you to enjoy. Newquay Sea Safaris and Fishing is a friendly, family run Charter Boat business. They provide thrilling sea safaris and fishing excursions that run from Newquay Harbour and their knowledge about the local sea life is second to none, which means their boat trips are fascinating as well as exciting. Their boats are the biggest and fastest in Newquay Harbour, and they’re a Master WiSe Accredited Operator, qualified to cause no harm or disturbance to the wildlife you’re watching. They can handle large groups as well as families. With 40 years’ experience of the ocean, Paddlefish offers thrilling deep sea fishing, mackerel fishing trips, scenic and historic coastal cruises for everyone, whether you’re a serious angler or a family wanting a fun day out on the waves. They even hire their fantastic boat – The Adventuress – out for parties. If you’re into boats, you’ll be interested to know she’s a really quick Lochin 33 craft with twin 318bhp Volvo Penta engines, and she’s fully insured to travel as far as sixty miles offshore. As well as boat tours and water sports, Newquay Activity Centre offers Coastline Coasteering, one of the most thrilling activities around for individuals and groups. Coasteering involves traversing the intertidal zone of our famously rocky coastline on foot, combining walking, climbing, rock-pooling and swimming, without boats, surf boards or anything else to hang onto. Yes, it’s a bit risky… but it’s also great fun! Adrenaline and extreme tours are on the menu at EBO Adventure, where you can also test-drive surfing, windsurfing and kitesurfing as well as taking boat tours. Coasteering is yours for the taking, along with climbing, kayaking, powerkiting, buggying, mountain biking and more, plenty for landlubbers as well as sea-lovers. Kayak down Frenchman’s Creek, or treat yourself to the North Coast Adventure. Boat tours and water sports are also on the cards with Koru, who offer brilliant guided kayak tours, the ultimate way to discover the remote beauty of our coastline without the crowds and the candy floss. They provide two hour tours with an experienced guide using sit-on kayaks, and on hot days you’ll stop off at a secluded beach for a swim in the warm, clear waters. The Water Sports Centre provides a vast range of water sports and associated activities. They do boat tours. But best of all, they do river rafting and tubing, both thrilling ways to experience life on the water from an entirely different perspective. If surfing is your dream and you can’t resist giving it a go, you have a choice of at least twenty excellent surf schools, all on your doorstep. If you want to try diving there’s plenty of scope for that too: try Atlantic Diving, Freedive UK or Wavecrest Scuba. 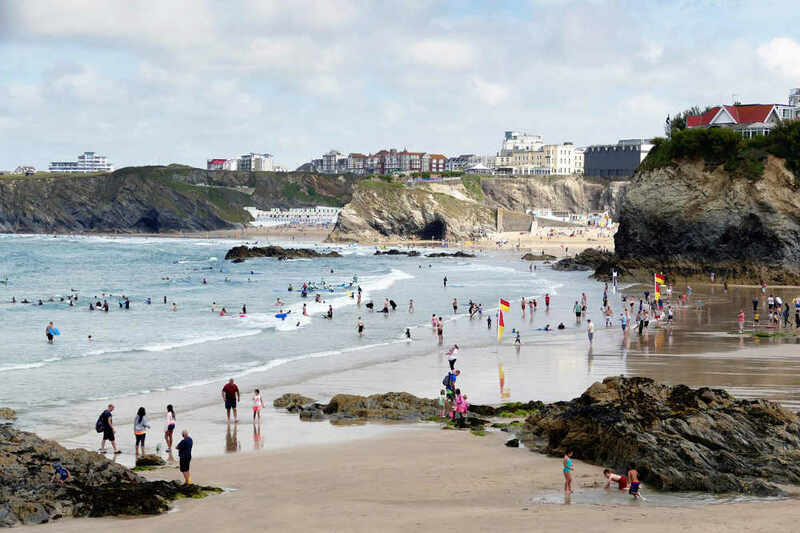 Are you looking for the perfect B&B in Newquay to make your base for all these adventures? Plenty of Newquay B&Bs, us included, tend to fill up fast when the weather’s good, so book early to avoid disappointment!